Otis Wagner, left, portrayed Archibald Gray, and Roxanne Judkins, right, portrayed Ann Stewart Patterson in the Greenfield Historical Society 2016 Ghost Walk. 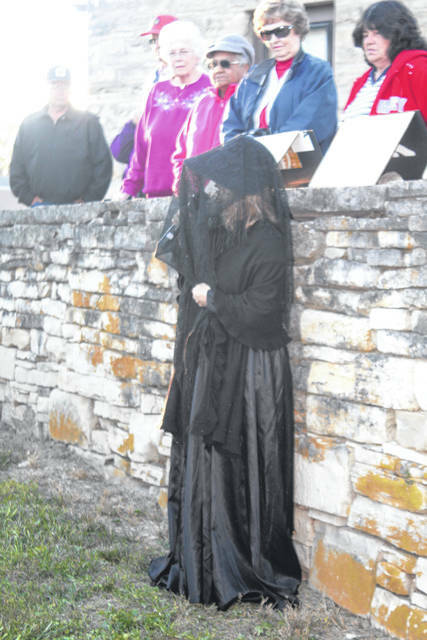 The woman who was possibly Greenfield’s first African American female resident, veterans of the War of 1812 and Civil War, and a couple that immigrated to America due to forbidden love will be among those featured when the Greenfield Historical Society holds its 14th annual Ghost Walk at 6 p.m. Monday, Oct. 8 at the Old Burying Ground. During recent work restoring the Old Burying Ground behind the Travellers Rest in Greenfield, Scott Andersen found the tombstone of Rachel Stafford. Her stone has been cleaned and repaired and now stands proudly in the old cemetery. John King had been looking for Stafford’s burial site for a long time and did research about her. Some sources say she was the first African American female in Greenfield. It is known that the Rev. Samuel Crothers bought a pair of shoes for a Stafford in 1848 and that in the 1850 U.S. Census, a former female slave named Rachel was living in Crothers’ household. Barbara Cole will portray Stafford during the walk. Danny Long will portray Andrew Arnott, who was born in Pennsylvania and served in the War of 1812. He and his wife, Julia Douglas Arnott, moved their family of eight children to Highland County by 1822. His grandsons, John Scott and Eugene Arnott, were the owners of a patent for a pneumatic oil can. John Scott Arnott also served as superintendent of the public schools and a short term as mayor of Greenfield. Joseph Robinson fell in love with the daughter of an English lord. When both parents objected to a marriage, Robinson and Jane eloped to America and originally settled in Pennsylvania. They worked hard, accumulated considerable property, and eventually settled in Highland County. Robinson will be portrayed by Eric Salyers. James Payton Leake was born in Virginia and was living in Highland County by 1840 when he married Mary Jane Rogers, the daughter of Thomas and Nancy Rogers. Five of their 11 children are buried in the Old Burying Ground. In the late 1860s, the Leakes moved to Sedalia, Mo., where Mary Jane died in 1876. James then married Matilda Ann Love and they had a son, James, who became a doctor and was employed as a medical officer with the Hygenic Laboratory in Washington, D.C. Roxanne Judkins will portray Matilda Leake. Terry Washburn will play the part of Daniel Leib, who was born in Pennsylvania and married Barbara Lasleyin in Fairfield County, Ohio in 1818. They were the parents of 14 children. In 1854, during the construction of a new mill, Daniel Leib died when he fell from a beam. According to his Civil War registration dated 1863, John Quincey Adams Buck was born in Maryland and his occupation was listed as a lecturer. He enlisted in Co. H, 27th Ohio Infantry in 1861, was promoted to full 1st lieutenant in 1863, and was commissioned as an officer in Co. G, U.S. Colored Troops 63rd Infantry. Bob Judkins will portray Adams. Jonathon Logan, who was born in Pennsylvania, was a stonemason who worked on many of the stone buildings in Greenfield as well as carving tombstones. His first wife was Mariah Blaine. She and three of their five children are buried in the Old Burying Ground. His second wife was Mary Myers. Their son, George, was a minister who moved to Montana. Loretta Hurley will portray Jonathon’s first wife, Mary, and tell the Logan story. The Old Burying Ground is located on McArthur Way. The event is free to the public. Free refreshments will be served after the walk in the Travellers Rest, which will be open so guests can view the historical society’s exhibits inside. On Saturday, Oct. 6 the Greenfield Historical Society will also hosts its annual History Day. A 5k run/walk will begin at 9 a.m. with the rest of the activities starting at 10 a.m.
Harold and Judy Schmidt of the Greenfield Historical Society provided information for this story. 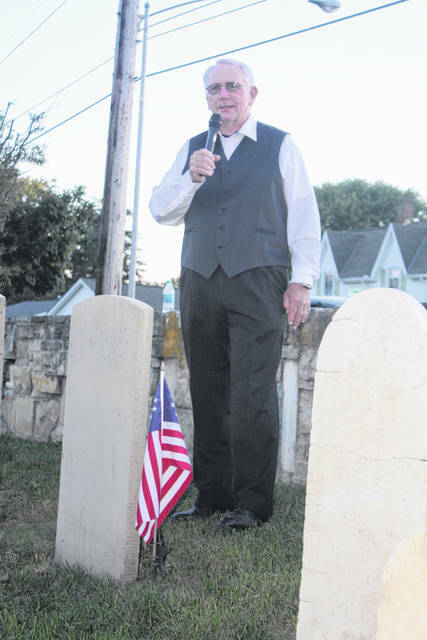 https://www.timesgazette.com/wp-content/uploads/sites/33/2018/10/web1_Ghost-pic-1.jpgOtis Wagner, left, portrayed Archibald Gray, and Roxanne Judkins, right, portrayed Ann Stewart Patterson in the Greenfield Historical Society 2016 Ghost Walk.